Unfocused busyness leads to meaningless contribution. You get so busy that you forget who you are and what you’re really trying to accomplish. The secret to meaningful busyness is direction and reflection. It’s necessary to let others impact the direction and agenda of your day. You’re interrupted by a pressing HR issue. The CEO needs information. Colleagues have questions. A customer needs you. An employee left in a huff. You can’t ignore pressing needs, but if you aren’t careful, you lose yourself to busyness. 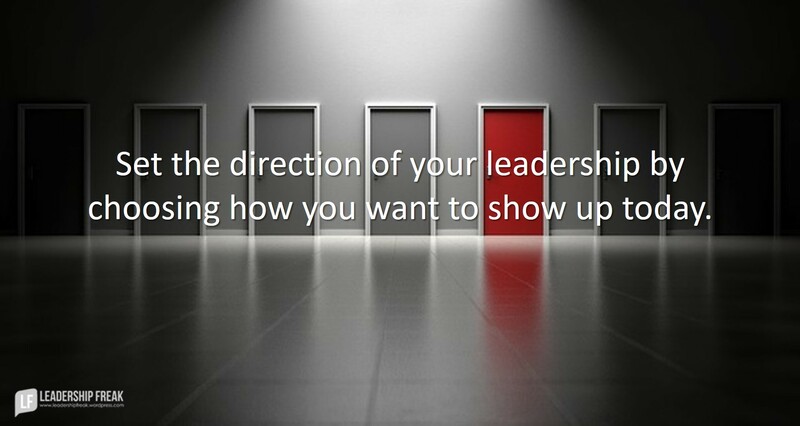 Establish direction to your leadership by choosing how you want to show up today. Set direction by choosing qualities and behaviors that reflect who you are and who you aspire to become. Are you great with relationships? Add some results oriented qualities. Are you great with results? Add some relational behaviors. What simple behaviors express how you choose to show up? What did you do yesterday that makes you proud? How might you clarify your intentions? What small contributions are you making to the people around you? How might you imperfectly step toward your personal aspirations today? Take a minute at the end of meetings to reflect on the impact of your interactions. Make appointments with email, text messages, and phone calls. Try scheduling responses at the top and bottom of the hour, for example. Stay present with people. Modify open door policies. Everyone gets two hours a day to close the door and focus on deep work. Seek feedback on what it’s like to sit across the table from you. How might leaders engage in meaningful busyness? Thanks Russell. Love the needle and thread illustration!! Greetings and many thanks. Botttom line, we get to choose our attitude everyday. Nicely said, Dennis. I keep learning that the way I think about people is more about me than about them. Channeling busy into productive is the key, I love the needle and thread above represents a simple concept. We tend to clutter sometimes and go no where, shed the luggage and keep thinks simple. If we accomplish nothing we failed in our mission which you point in direction, “as long as we move forward” with direction of the journey focused on primary functions of our Leadership. Thanks Tim. It’s true that we can be busy but not get the real stuff done. Frankly, I think it’s pretty common. I can see that a useful evaluation question might be, “what did I really get done today?” If we’re unsure, it’s likely we were sewing without the thread. “Busy” is the buzz word and excuse that actually says “I’m not scheduling my time and priorities appropriately.” I, too, love the sewing machine analogy. Good post, Dan. Wow! How timely. I work in local government and have been immersed in response to Hurricane Matthew as well as trying to keep my regular duties. I just got challenged on how was I communicating the awesome work folks were doing to the entirety of our department. I thanked individuals but completely missed the opportunity to celebrate with everyone our organizational values in action. There is still time to clean it up but…I strive to be the leader in our organization and sometimes that load can be heavy. I am thankful to have those around me who will challenge me when needed. At the same time I can’t say it doesn’t hurt a bit when you are crazy busy trying to serve in many areas. Thanks Ken. It’s always powerful when people share stories like yours. You remind me that part of leading is keeping the big picture in mind. Busyness narrows our focus. Thank you for this, Dan! Your wisdom could not have come at a better time, as I seek to reflect on my own #busyness and it’s affect on my presence at work. The path is the goal! I can’t help but realizing busyness and business are only one letter away from being the same word! Have you ever worked non-stop every second of the day and realized at night that you got nowhere with what truly matters? That’s how you can tell you’ve been doing busyness instead of business. I know it happens to me a lot! The challenge is: how do we move from being in “emergency” mode 24/7 to really doing work that matters? Ah… you read Dan Rockwell and let him be your Sensei. My apology Dan, I want to comment here but I’m too busy. Busyness first ya know!